Workers in certain industries may be at risk of injuries from fire and explosions in the workplace. Shards of shrapnel and pieces of debris and metal can cause puncture wounds, eye injuries and severe lacerations. But flying debris isn’t the only danger. Shock waves —even mild shock waves—may cause damage. Exposure to shock waves can cause disorientation, headaches and other minor symptoms. 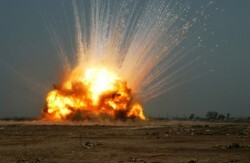 Other types of brain injuries may not be immediately evident after an explosion. When a person is exposed even to a minor explosion, he or she may suffer chemical change from the impact of less-powerful shockwaves. A new study in the Journal of Alzheimer’s Disease finds that exposure to even minor explosions can cause changes to the brain similar to those seen in patients with Alzheimer’s disease. Researchers at the University of Washington and University of Alberta found that after continued exposure to blasts, rats began to exhibit elevated levels of phospho-tau, a molecule that can actually cause damage to brain cells. Tangles of the tau protein are found in the brains of people who have died of Alzheimer’s disease and of traumatic brain injuries. Inspectors with the Occupational Safety and Health Administration recently cited Georgia Power for multiple serious safety violations after a generator explosion at Plant Bowen near Cartersville. Although no serious injuries were reported, at least three people suffered minor injuries. The explosion occurred in April in the building that stores the generator and turbines for the plant as workers were shutting down Unit Number 2 for maintenance. The Occupational Safety and Health Administration identified 17 safety violations that need correcting and has proposed fines of $119,000 for Georgia Power. The OSHA investigation uncovered workplace safety violations that exposed workers to serious health hazards including failure to ensure that the worker in charge held a safety briefing before they start each job and failure to develop and record procedures to control potentially hazardous energy. According to OSHA, Georgia Power needs to immediately begin addressing these issues. However, Georgia Power has said its own investigation soon after the incident found that worker error, and not equipment failure, caused the explosion. According to the company, utility workers failed to comply with established procedures. The company also said communication problems among the workers contributed to the accident. Employers have a fundamental responsibility to maintain safe workplaces and prevent foreseeable hazards and injured workers have legal rights to seek compensation if they have been injured.